Recent increases in cyberattacks and identity theft make it seem like the whole Internet is turning into the Dark Web. But while no system is unhackable, there are some painless precautions you can follow that might help keep you step ahead of the bad guys. Spyware – software that collects information about you or your computer without your knowledge. 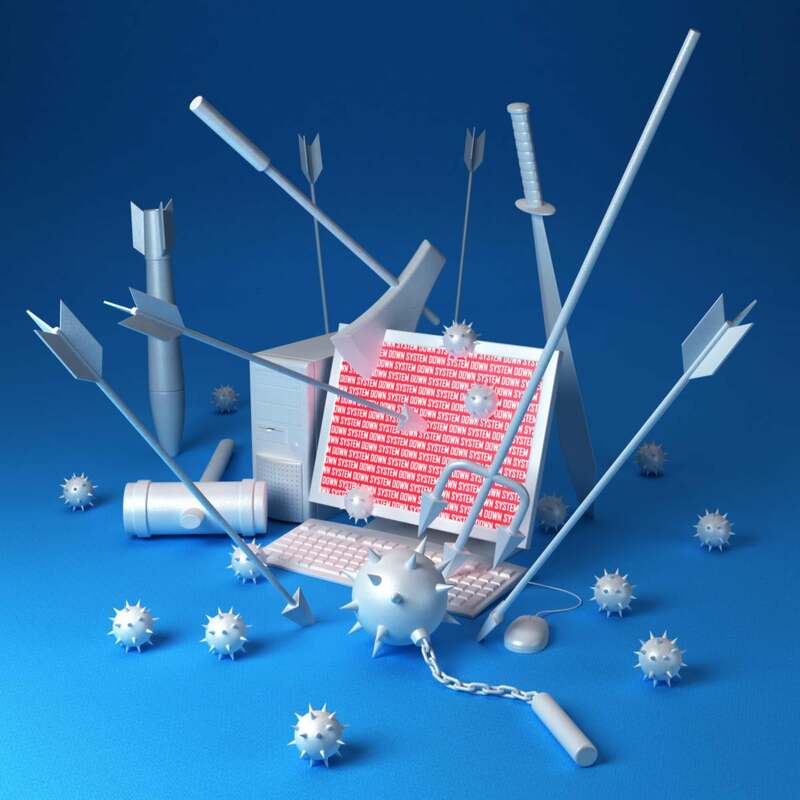 Malware – a broad category of software (including viruses, worms, Trojan horses, etc.) that damages your computer, in either a minor or major way. Phishing – an attempt to get your personal information (usernames, passwords, credit card numbers and), usually for nefarious reasons. Usually accomplished by electronic communication (e.g., email), but also by "social engineering" (tricking people into abandoning standard security protocol). Ransomware – a much more extreme version of spyware that will actually threaten to lock you out of your computer or encrypt your files unless you cough up a fee. Most of these are easier to avoid than they are to remove. The following easy-to-implement security practices will help you protect yourself and your business from becoming easy targets for cybercriminals and online scammers. Passwords are convenient and tried-and-tested when it comes to securing your online accounts and digital data. However, the major downside is their susceptibility to being stolen using spyware or through trickery. The use of two-factor authentication (2FA), however, is a good defense against account compromise even when the bad guys have your passwords. Basically, 2FA adds another layer of protection after your password, usually by combining one factor (your password) with a second factor (a text message/verification code sent to your cellphone number). As you can imagine, two-factor authentication works only if they are set up ahead of time, so do look into enabling it for all your online services and accounts. In fact, Telesign recently launched turnon2fa.com, a free and comprehensive guide on how to enable 2FA on more than 100 popular websites. A successful spyware or phishing event could give hackers the credentials for an online service, which they can access for their criminal activity. This can be particularly problematic when undetected, and can result in liabilities or repercussions that their victims are left to deal with. Fortunately, most Web services offer the capability to track the most recent logins in the context of the time it occurred, the mode of access and the destination IP address. The latter makes it possible to deduce the location of access, and can serve as a red flag; if you see logins to your account from physical locations you’ve never been to, it may be time to change the password. A common practice for many app-based online services is to create a unique security token after the initial authentication to eliminate the need to key in the password again. The list of authorized devices is typically easy to access, which is a great way to check if someone else is accessing an account on the sly. Moreover, users who believe that their password may have been compromised are well-advised to delete all authorized devices immediately after changing their password, which will de-authenticate unauthorized parties. Still, anti-malware software does offer a good basic defense against known and older malware, freeing up their cerebral matter to discern phishing attempts. AV-TEST, an independent IT security provider, publishes an updated list of some of the best anti-malware software for Windows users. If you’re like most people, it’s easy to ignore those pesky pop-up boxes imploring you to install software updates, even when they include important security patches. The bottom line is that doing so places you at great risk. Hackers can take just days or even hours to dissemble the latest security updates once they’re released by software companies, determine the problem they address and to construct a malware that exploits it. While the option of denying updates is no longer available to Windows 10 users, most software lets you delay the installation of updates indefinitely. With this in mind, you should attempt to load patches as soon or as often as possible to stay protected. This should be obvious, but it's still a security plague: You should never give out your passwords to anyone, period. Legitimate administrators will already have the appropriate level of access to perform whatever actions they require – without having to ask for your password. As it is, anyone asking you for your password should immediately be suspect, especially if it happens over a faceless medium such as email or a chat app. In which case you have to assume the sender’s accounts have been compromised. A common trick of the bad guys is to get their victims to click on a URL link that brings them to a malicious website. The site may either attempt to inject a security exploit to attack the visiting browser, or it may be designed to look like a legitimate website as part of an elaborate phishing attempt. And yes, people are still doing it. While it seemingly peaked as an issue about 10 years ago, new studies have shown that malicious attachments are back on the scene as a security risk. There are so many ways to mask or obfuscate a real link that it’s better not to click on links sent via email messages at all. A safer move is to type it out the URL manually into the web browser instead of relying on the supplied link. While backups are not typically mentioned when it comes to security practices, they’re a crucial safeguard against a new breed of security threats called ransomware, which works by threating to encrypt user file or even lock users out of their computer altogether. Once done, it then attempt to exact a ransom for the secret key required to unlock the data or computer. An offline backup allows businesses to restore their files without paying the ransom. Note that cloud sync services are generally not a good option here – because any encrypted files (such as ransomware) will just be synchronized to the cloud, as well as across all devices – though those that offer an unlimited number of backups could potentially work. However, only Dropbox for Business offers this at the moment. This story, "8 ways to fend off spyware, malware and ransomware" was originally published by CIO.